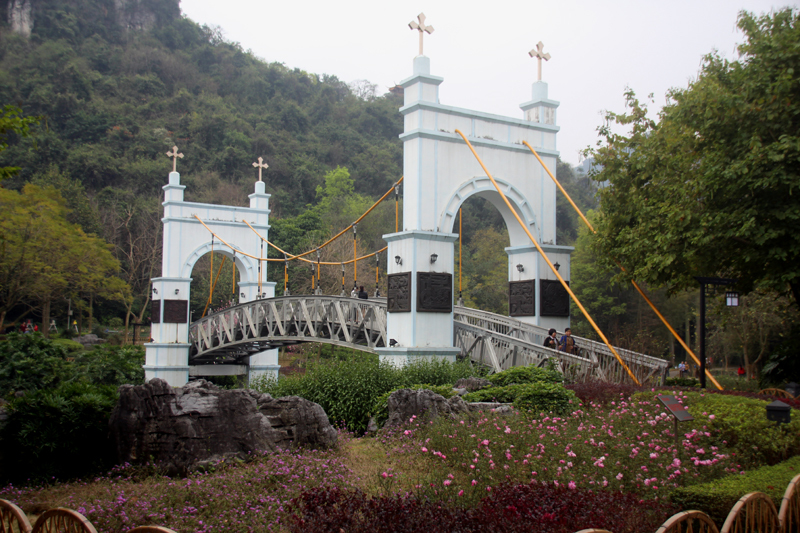 The largest in town is Longtan Park, in the south of the city. 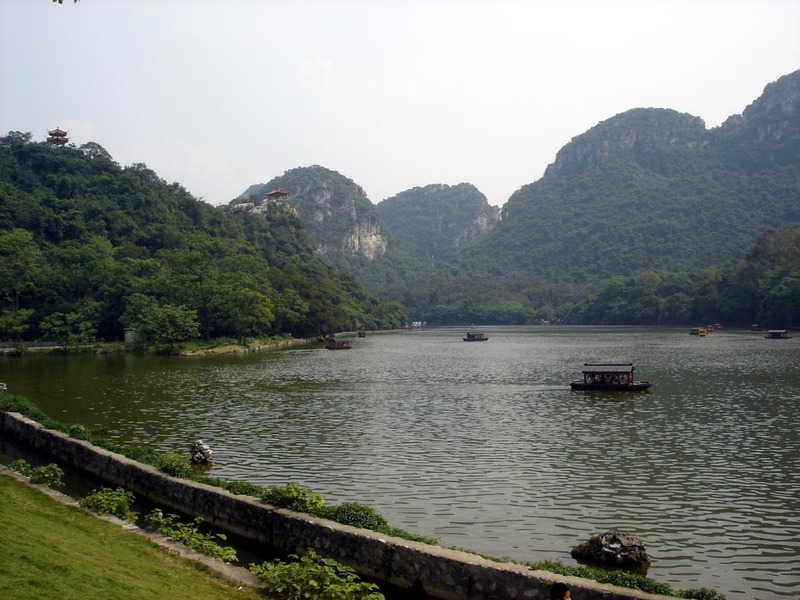 Officially known as Longtan Scenic Spot, the park is set in a beautiful area of karst hills and lakes. Around the park are unconvincing minority villages supposedly in the style of the local Zhuang, Yao, Miao and Dong peoples. There is also a pathetic attempt to copy a Dong style Wind and Rain bridge. The Dong are noted for their bridge building skills and their bridges are all-wooden with no nails. This travesty is made of concrete painted to sort of look like wood. 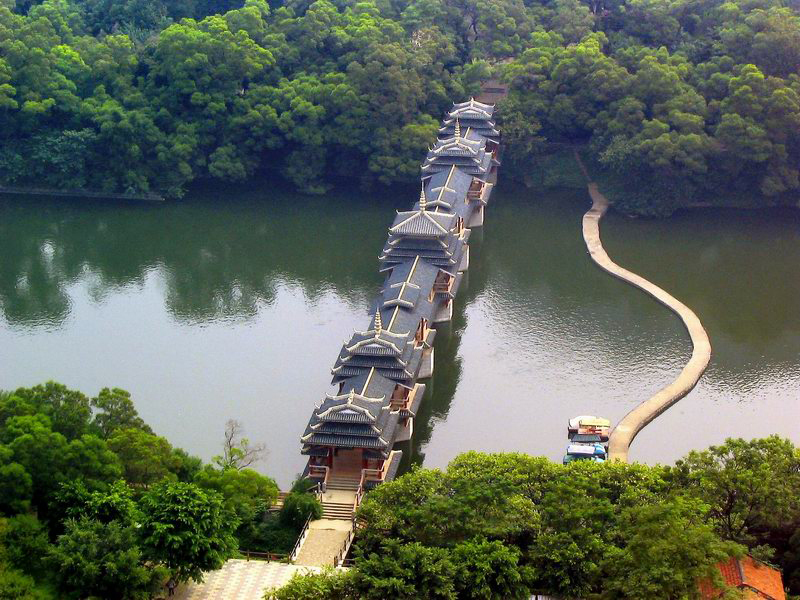 Good to Sanjiang in the north of Liuzhou prefecture to see the real things. The park also contains a "Friendship Garden" to mark Liuzhou's long term sister-city relationship with Cincinnati. 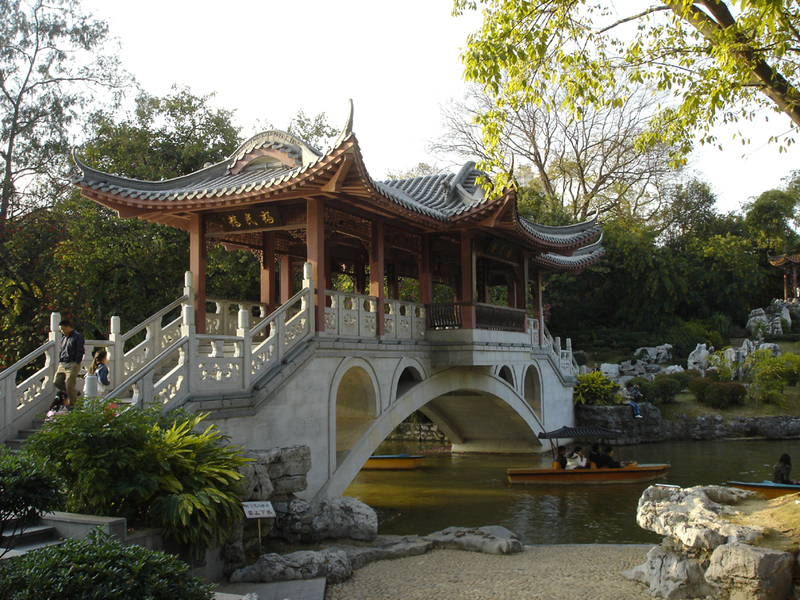 This garden also contains a fake bridge, supposedly a replica of the famous bridge in Cincinnati. Hmmm. There is also a good "Minority Restaurant" serving food typical of the local ethnic minorities. The park, despite being somewhat over-manicured for my tastes, is a pleasant spot and is large enough for it to be able to find quiet spots. The trees and flora are well cared for (the park is partly also a plant research centre). There are a few escaped parakeets breeding in the park, too as well as indigenous birds. There is a kids' playground and donkey rides. 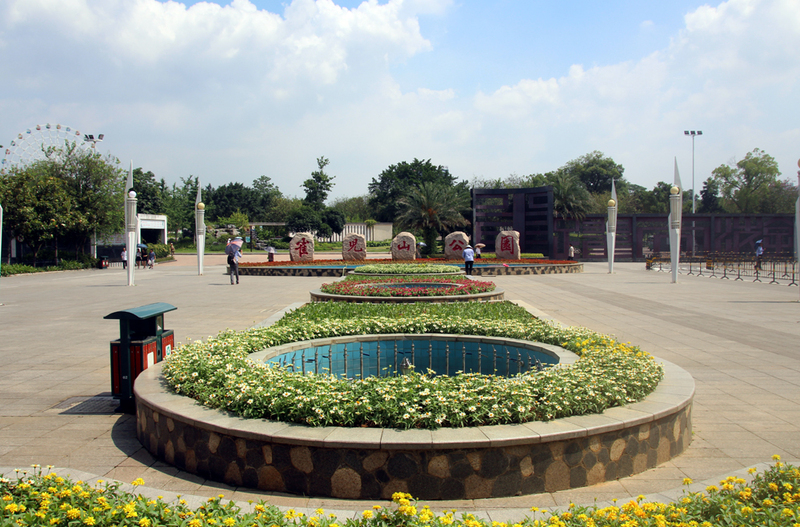 Situated in the centre of the city, near the city' People's Square, this park is a commemoration of Liu Zongyuan (A.D.773-819) who was born in Shaanxi Province, and was a famous writer, thinker and politician of the Tang Dynasty. He held a diplomatic post but was demoted for taking part in a failed political reform movement. He held office in Liuzhou during the latter part of his life (A.D.815-819). During his time in Liuzhou, Liu Zongyuan apparently issued orders to reform the local law, stipulating that slaves could redeem themselves. He contributed money to help poorer families regain their freedom and attached great importance to agricultural production, organising farmers to open up the wasteland and plant bamboo and other trees. Liu Zongyuan wrote many famous articles among which “Words from Heaven”, “Answers from the Earth”, “The Theory of No National Borders” and “The Nature of Royalty”, written after he was demoted, are philosophical works and a strong attack on the then popular theology. Liu Zongyuan also held that “the desire of the common people” is the impetus behind the development of history and denied the point of view that history is created by “Gods” and "sages". Liu Zongyuan made a remarkable contribution to Chinese literature. He advocated the use of colloquial Chinese rather the ancient style of writing used since the Six Dynasties (420 to 589 AD). His articles are sharply penetrating and persuasive. 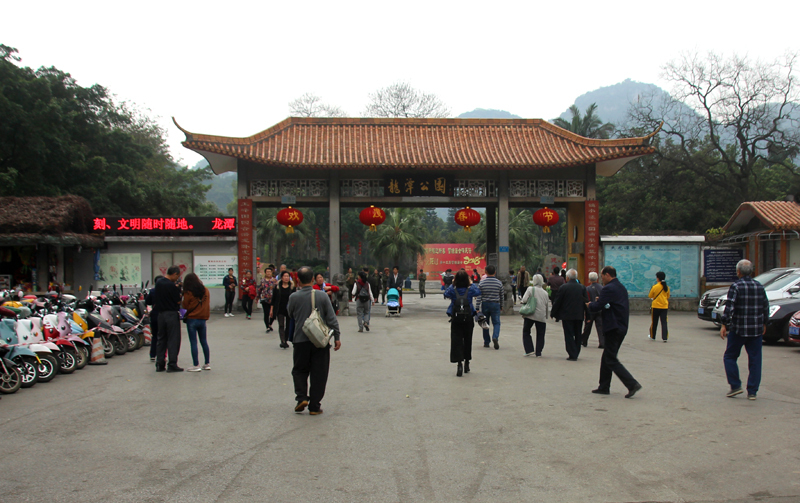 Three years after his death, Luochi Temple was built to offer sacrifices to Liu Zongyuan. 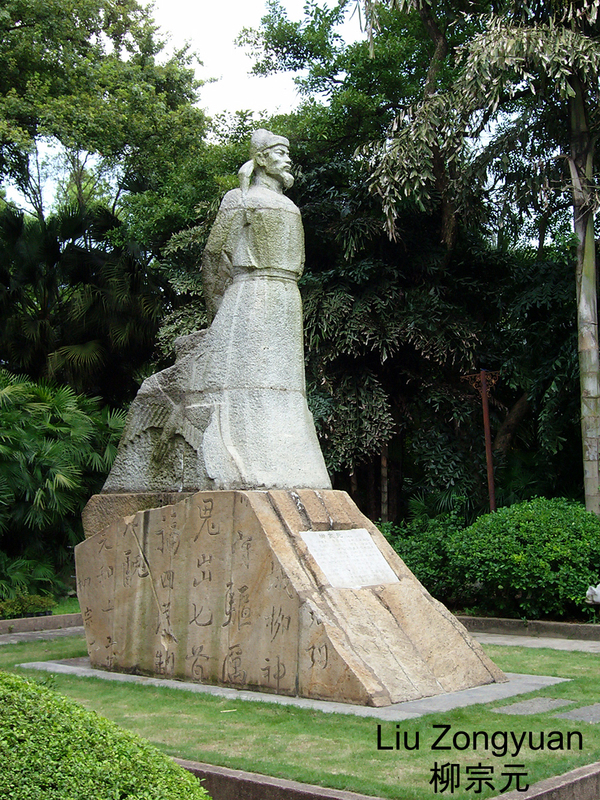 The temple, located in Liuhou Park, is simple yet imposing, with bronze statues of Liu Zongyuan and his subordinates. Also, there are historical relics, diagrams, paintings and calligraphy introducing in detail the life of, and historical deeds done by, Liu Zongyuan. There are more than 40 stone tablets inside the temple including the famous "Stone Tablet of Dragon City" written by Liu Zongyuan. And no, I didn't mis-spell it. It isn't Liuzhou Park! 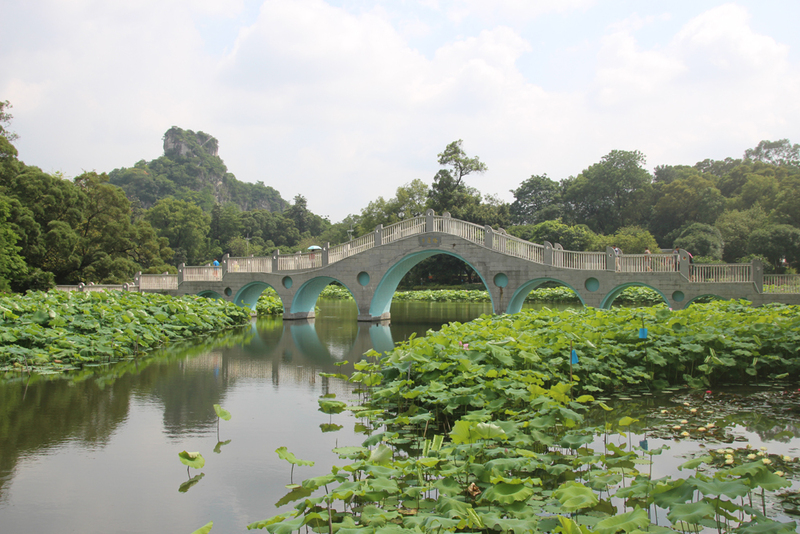 It is Liuhou Park. A small difference in English, big difference in Chinese! Don't come here looking for a peaceful walk in the park. It is a favourite spot for people to dance, sing, play music. It can be cacophonous at times. This scenic area is near the city centre, just south of the main No. 1 river bridge. Spread over two hills - Yufeng Hill (鱼峰山 yú fēng shān) and Ma'an Hill (马鞍山 mǎ ān shān) - this is an ideal place to view the city. 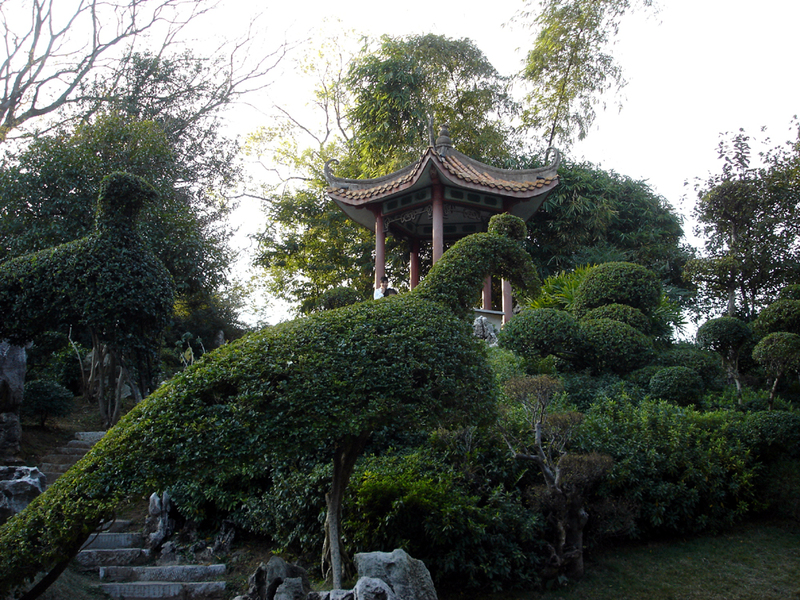 Yufeng Hill is allegedly shaped liked a carp leaping into the air and Ma'an is shaped like a horse saddle. The two hills are accessible and linked by cable car and there are paths for the more agile!The hills contain caves which were inhabited thousands of years ago and the whole area is the site of numerous legends. 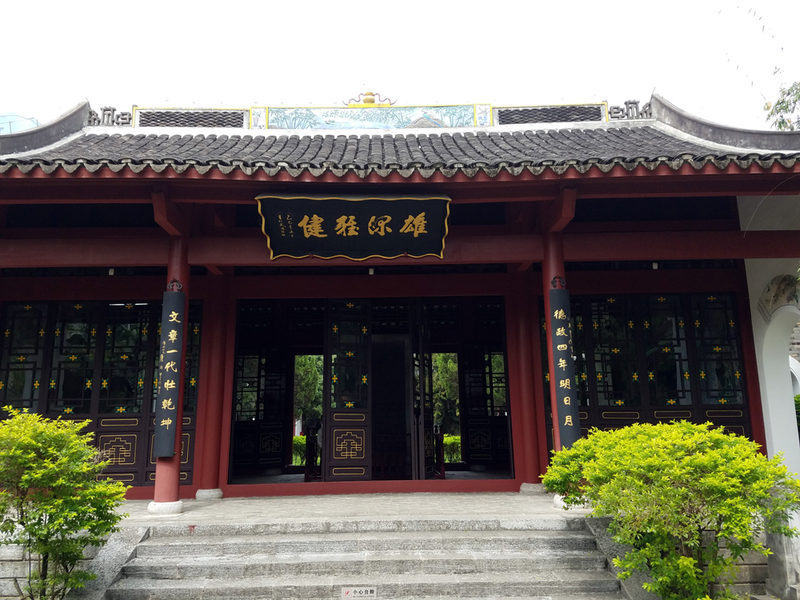 Among these are the legend of Liu Sanjie, a Zhuang nationality folk singer who rose to heaven on the back of the carp, and the legend of two of the 'Great Immortals' who played chess here. On Ma'an hill there is a large depression which is said to be the footprint of one of these immortals. Also, on the No. 19 bus route. Que'er Shan Park lies at the northern end of the No. 19 bus route. The terminal is right outside the main (south) gate. This is probably my favourite in the city. Although there are areas of formal flower gardens and topiary (mostly camels and dinosaurs), the largest part of this park retains a natural, wild look. 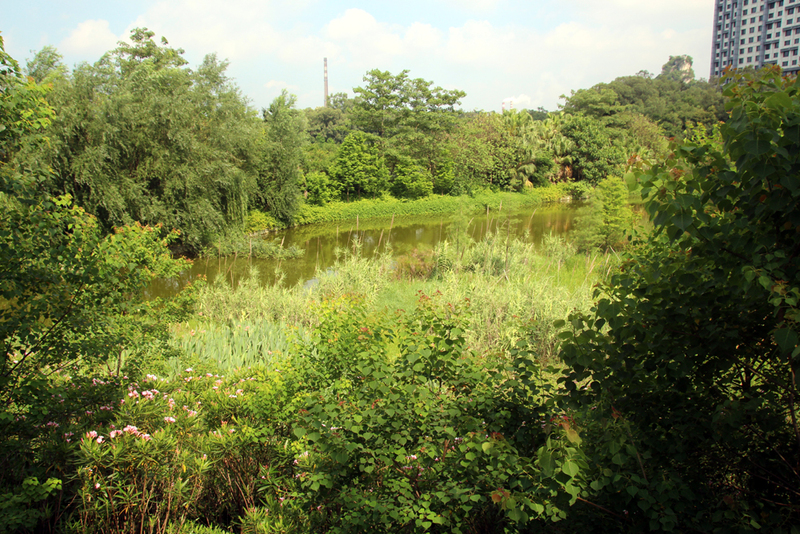 There is a wetlands area which has attracted over 50 varieties of birds. 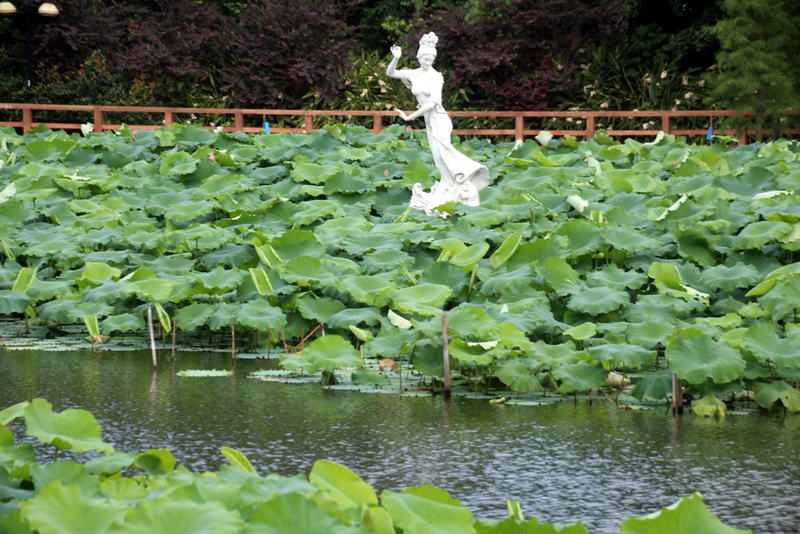 The park also features a large area of ponds planted with lotus. In flowering season it is stunningly beautiful.